What makes a Lake District holiday into a romantic break? 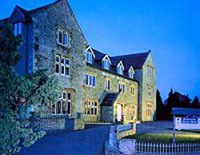 Beautiful scenery, wonderful accommodation, a luxurious bed, fantastic food? All that, of course, but also there's that intangible something - the hospitality and service you receive, the degree of care and comfort you experience - qualities which we believe come down to the care and attention of the proprietor and the hotel team. Only when a team are putting their heart and soul into what they do - only when they really care about your enjoyment - can you be sure that you have the setting for a truly romantic break in which you can rekindle and explore your relationship. 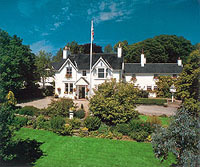 Below we've listed our selection of Lake District Hotels which seem to fulfil these qualities. Let's face it, when you're looking for a romantic break, it's nice to have all the trimmings: roses, chocolates, champagne, not to mention king sized beds, rooms set in magnificent private grounds, overlooking beautiful scenery, superb food and wines, and - did I mention this? - a superb bed to love and lie in. 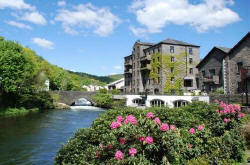 Linthwaite are the masters of this art, and you'll have to go a long way to find a better location for a romantic break. Highly recommended. Yes, this hotel really is romantic - with a capital "R". Set in the most beautiful grounds, with ten suites split between the main house and cottages in the grounds, you'll find every conceivable comfort already provided, and every imaginable need will be met. There's probably nowhere more suited to a loving weekend with your beloved than this hotel - and though you may consider it pricey, you certainly get what you pay for - and much, much more. To ensure you don't have to stir your stumps, breakfast will be served in your room at any time. What more could you ask for? Well, just look at the superb dinner menu! Highly recommended. We mentioned the Gilpin Lodge on the luxury hotels page, and it's here again because they offer an absolutely superb romantic setting that's both peaceful and luxurious. They also have everything you could want for a romantic break including king sized beds, spa baths and private suites. Highly Recommended. A beautiful hotel, though it's a little way out of town. But it gets unqualified positive reviews for service, comfort and food, and they'll provide flowers, chocs, and all the trimmings for a romantic break. This hotel was used as a factory and mill decades ago, and it's nice to see the building back in use as a splendid hotel with all the facilities: spa, pool, fitness studio, four poster beds and so on. It's in a most beautiful location on the banks of the River Leven, and it's ideally placed for touring the southern Lake District. They offer a full romantic package with all the trimmings - champagne, chocolate, flowers, and so on, and the menu in the restaurant does look rather delicious! We haven't actually stayed here ourselves, but we have several friends who have and they rate the hotel highly. More feedback would be appreciated! All of the luxury hotels on the luxury hotels page of this website offer a superb location for a romantic break. You can check them out by clicking here. Ah, what can I say about this establishment? We dined here on Christmas Eve, with the backdrop of Cartmel Village set brightly against the hills on a clear winter's evening, and it was one of the most romantic settings I've ever seen (and I've seen a few). Simon Rogan's Michelin starred establishment serves up a fascinating and unusual array of dishes, superbly cooked and imaginatively created, with the fine attention to detail you'd expect. 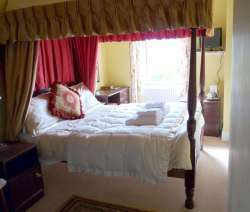 The rooms are, as you'd also expect, superbly equipped and furnished with style. I love this kind of place - and ten years ago it certainly didn't exist in the Lakes, if indeed it existed in England. Yet both the Lake District and England are much the better for this recent development in food and accommodation. It's exactly the kind of place where your troubles fall away and you can lie in the lap of luxury. There are several good hotels in Kendal, all of which can offer you the pleasures of this ancient market town and easy access to the southern Lake District. The one we know best is Stonecross Manor. It's not in the ultimate league of luxury, but what it does, it does very well. They have rooms with four posters and king sized beds, and a decent restaurant. They've also undertaken a lot of refurbishment recently which has improved the standards of their rooms considerably. We stayed at this hotel a little while ago and enjoyed it enormously. The staff do their best to meet all your needs in a friendly and efficient way, so you'll feel right at home from the moment you walk in. 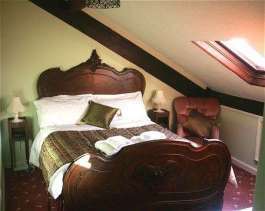 The hotel has large, comfortable bedrooms, some with four posters and spa baths, an excellent setting and a great restaurant! The hotel prides itself on fine dining, and rightly so. Another of the wonderful things about staying here is the view from the bedroom windows - you can go to bed listening to the burbling of the River Rothay and wake up to a view of some of the most spectacular scenery in England. Recommended for a romantic break - and every other kind of break else as well! This is a most charming little place in the extremely beautiful North Lakes. The bedrooms have recently been refurbished, a range of rooms including family suites are available, and the food is what I'd describe as good honest Lakeland fare - cooked with flair. Recommended if you want something more homely than big luxury hotels with a similar level of comfort from log fires, low beams, plenty of character, a traditional pub atmosphere and modern bedrooms. And it's quiet,. secluded and set in the most gorgeous scenery. Yes, an all round good place! They even have festivals (a jazz festival, a food festival, and so on), and their own brewery! Check it out, and enjoy this part of the northern Lakes from a base of unique character and flair. 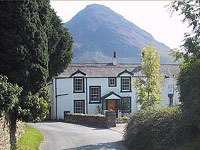 A very comfortable and characterful Inn on the shores of Bassenthwaite Lake, with everything you could need for a wonderful break in this part of the Lake District. All too often these days individual character has been sacrificed to wrong-headed ideas of modernity - but here, the old and the new blend superbly well. The bedrooms have been completely refurbished to give a variety of suites and rooms, and the bathrooms offer just about as good an experience as you could find in any 5 star modern town house hotel. And the food....well, it's superb. The chef serves local produce, freshly prepared, cooked with skill, and imaginatively served in a way that will add that extra special finishing touch to your holiday. Highly Recommended. 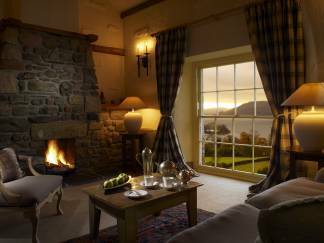 The Samling hotel really is the perfect hotel for a romantic break. 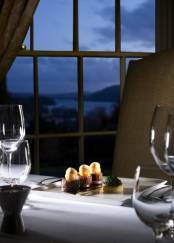 Set in 67 acres of land the hotel has 11 beautifully appointed bedrooms with stunning views over Lake Windermere, any one of which will make the perfect venue for a special break with your loved one. 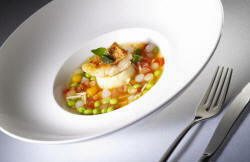 The restaurant at the hotel uses the finest, freshest local ingredients cooked to perfection and has received numerous Michelin stars and AA Rosettes over the years. The excellent cuisine, combined with the sophisticated yet relaxed atmosphere in the evening, help to set this hotel apart form others in the field. Celebrities including David Beckham and Tom Cruise have whisked their loved ones away to The Samling for a romantic weekend away. And for that special touch, try champagne in the hot-tub - it's an absolute "must" that really can add extra sparkle to your romantic break! 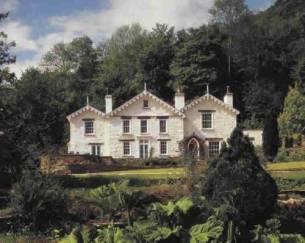 Built of solid Lakeland stone in 1868, Blenheim Lodge is an elegant Victorian house in a very convenient location, overlooking Lake Windermere, with views to the hills and fells beyond. 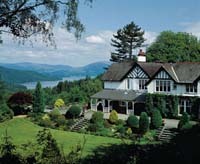 Set against acres of National Park woodlands, but only 5 minutes' walk from the centre of Bowness on Windermere and Lake Windermere, Blenheim Lodge offers you the opportunity to get away from it all and enjoy a relaxing romantic break in comfortable accommodation that really feels like a "home away from home." 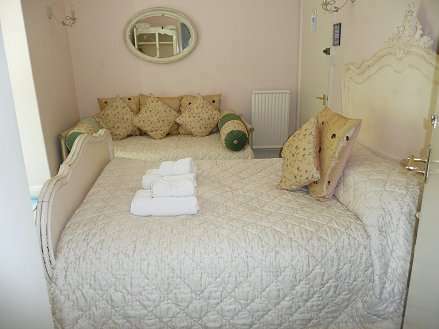 Guests who love period or quirky houses will appreciate this characterful, graceful guest house. All the rooms are different in style and size, but none compromise on a good night's sleep. Seven rooms feature deep and comfortable handmade pocket sprung mattresses, and one room has a handmade bespoke mattress for a unique four-poster bed. Look for quality soft furnishings and towels, and enjoy the antique and vintage furniture in the rooms. Single and triple bay and velux windows open out to beautiful Lake or woodland views. To make your break even more special, for an extra charge, Blenheim Lodge will arrange treats such as handmade chocolate truffles, champagne, wine, and flowers to welcome you into your room. If you wish to take advantage of this facility, perhaps to surprise your loved one, you can arrange these gifts when you book your accommodation. If you prefer, the owners, Janz and Robert, will tailor-make a gift voucher you can give as a special gift to your loved one. We think one of the best features of the Lodge is the homely and friendly atmosphere - always a good start for a romantic break! Janz and Robert are always willing to help make your stay special: for example, they can tell you about local restaurants, including Michelin starred establishments, help you book spa and beauty treatments at the country club where all the Lodge guests receive free membership, and they even have two free fishing permits for guests' exclusive use (available on a first come first served basis). Finally, for something unique that will really impress your special someone, Blenheim Lodge can arrange a lovely 4-course dinner cruise on board a yacht on Lake Windermere, or a buffet lunch and sailing trip, during which you can try a turn at the helm. Many guests have not only enjoyed the experience of celebrating their birthdays, anniversaries, and honeymoons in this way - some have even proposed on board! This is what makes a romantic break here so memorable - being treated like a special guest with such excellent service (and of course having the chance to enjoy the Lakes' wonderful countryside as well as the special treats on offer).